The Hon. 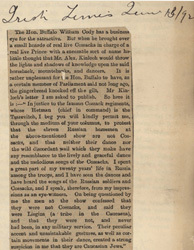 Buffalo William Cody has a business eye for the attractive. But when he brought over a small hoarde of real live Cossacks in charge of a real live Prince with a sneezable sort of name he little though that Mr. Alex. Kinloch would throw the lights and shadows of knowledge upon the said horseback, mountebanks, and dancers. It is rather unpleasant for the Hon. Buffalo to have, as a certain member of Parliament said not long ago, the gingerbread knocked off the gilt. Mr Kinlock's letter I am asked to publish. 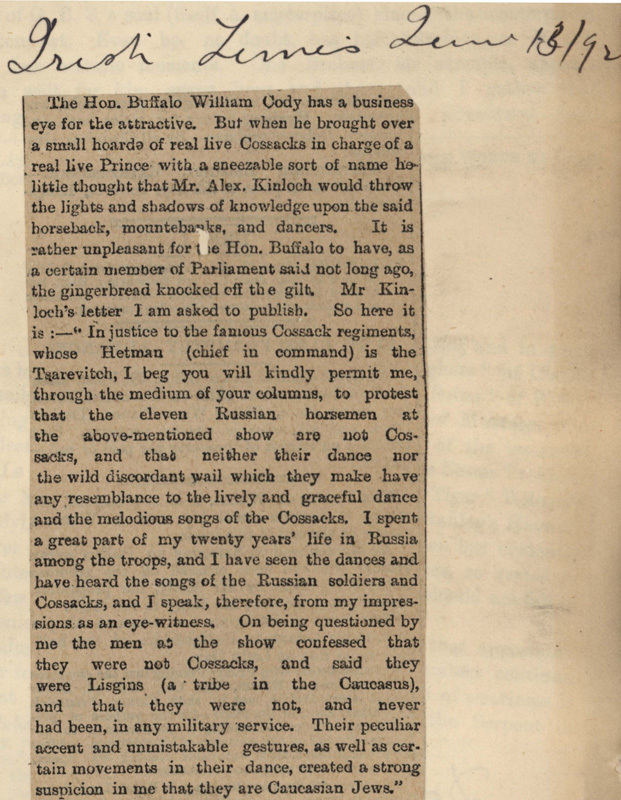 So here it is:—"In justice to the famous Cossack regiments, whose Hetman (chief in command) is the Tsarevitch, I beg you will kindly permit me, through the medium of your columns, to protest that the eleven Russian horsemen at the above-mentioned show are not Cossacks, and that neither their dance nor the wild discordant wail which they make have any resemblance to the lively and graceful dance and the melodious songs of the Cossacks. I spent a great part of my twenty years' life in Russia among the troops, and I have seen the dances and have heard the songs of the Russian soldiers and Cossacks, and I speak, therefore, from my impressions as an eye-witness. On being questioned by me the men at the show confessed that they were not Cossacks, and said they were Lisgins (a tribe in the Caucasus), and that they were not, and never had been, in any military service. Their peculiar accent and unmistakable gestures, as well as certain movements in their dance, created a strong suspicion in me that they are Caucasian Jews."